What is a Lunch and Learn? Who do you invite? What makes for a great topic? Building business relationships is essential for a loan originator. One of the most mutually beneficial relationships is the one between a realtor and a loan officer. 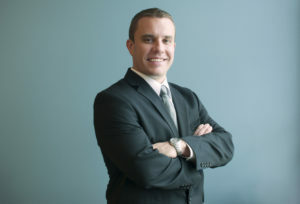 Justus Sharp is a loan originator for NFM Lending out of the company’s Columbus, Ohio branch. Daniel Sa is the Branch Manager in Ohio. Justus is on-pace to close between 120-130 loans in 2017 through hard work in building, nurturing and maintaining those relationships with realtors, title companies, builders and other settlement services providers. In this podcast, Justus talks about the key to his success, including the use of Lunch and Learns to provide educational opportunities and experiences for realtors and other business partners. Want to know how you can incorporate Lunch and Learns to build referral partner relationships? Take a listen. For more information on Justus and his team, visit nfmlending..com/jsharp. Greg Sher: It’s time to welcome in one of NFM’s brightest producers and best producers, Justus Sharp from our Columbus, Ohio branch. Justus, this year in 2017, on pace to close between 120 and 130 units. Huge numbers. Justus, it’s a pleasure to talk to you. How are you? Justus Sharp: Doing well, Thanks, Greg. I appreciate the introduction. Greg Sher: Absolutely. That’s a big number. 120 to 130 units. It’s not easily achievable. How do you do it? Justus Sharp: I’ve been in the business for a while. It’s mainly through fostering great relationships with realtors, business partners, sphere of influence, just being out in the community and being forefront and trying to be top of mind with anyone we’re engaged with throughout the years. Greg Sher: And so of those 120 and 130 units, do you know roughly what percentage are purchase? Justus Sharp: Percentage-wise, probably close to 85 to 90. Mainly past clients will contact us about refinancing and whatnot, but the vast majority is purchase business from realtors. Greg Sher: And I think there are two schools of thought when it comes to grabbing realtors. Some people like to just a core three, four, or five to send them 80% or more of their business. Others will just take one deal here, one deal there, and collect as many agents as they can. How do you go about grabbing your agent relationships? Justus Sharp: Diving a little deeper. Just making sure they’re a good fit, that they do business the way that I would and we can feed off of each other to make sure that the client’s taken care of from a standpoint, not only just communication, but also long term, because when we partner up with those realtors, we tell them, hey, we want to be around for the next time this client five years, seven years, 10 years down the road wants to do this again. It’s deeper relationships. Not as many relationships, but probably deeper relationships. Greg Sher: And so what are some of the main points in terms of the value proposition that you put forward, should the realtor be a good fit? What can they expect from you, a top producer during the process and beyond? Justus Sharp: Just an open mind, too. Because I want to know mainly … when we started a lot of the relationships it was do they have the mindset of growth. Do they want to continue to grow their business? Are they exiting the business soon? Are they bringing somebody else on to take over their book of business? What do those things look like? Because if you don’t treat it like a business, it won’t perform like a business. But having that business relationship first, has helped me to garner the friendship second. After quite a bit of time and knowing that we’re hitting on what they want us to deliver, and that’s excellent response time, good communication, knowledge about the product, and just make them look good and make sure that things close on time and close accurately, those are the main things that almost all realtors are looking for that we touch base with or interview. Greg Sher: Okay, so you spend a lot of time trying to make sure that it’s a well oiled process from beginning to end so you can continue to get more business from the realtor on the buyer’s side. What about the listing side? What do you do to approach the agent on the other side of the table, who represents the person selling the home? What’s your approach with them and do you try and approach every listing agent at some point during the process? Justus Sharp: Yeah. We do follow the core model. On Tuesdays, I will call the agents and make sure that we’re following up. Make sure they’re getting the communication. If it’s an initial contract, there’s an intro script that we have to just make that opening conversation about the file and also just picking their brain on their business and seeing again if they’re a good fit or if there’s somebody that we want to go after if they are … maybe it’s their first deal. Maybe they’re a new realtor. I don’t ever just place somebody off for that. If they’re new, I go back to hey, are you willing to grow your business? Are you doing this full time? And I “attack” the listing agent just to find out more about their business and again see if they’re a good fit. Greg Sher: I’m Greg Sher, Chief Business Development Officer of NFM Lending. You’re listening to one of our many valuable podcasts on NFM Media. I’m with Justus Sharp right now, one of the company’s top loan officers, projected to close between 120 and 130 units in 2017 out of our Columbus, Ohio branch. Justus, let’s get into lunch and learns. I know you do a lot of these things. What are they? Justus Sharp: Sure. It’s a pretty simple concept. Just hosting an event for realtors, your business partners, and it be a topical-based. Maybe it’s about the appraisal process. Maybe it’s about underwriting, continuing education. There’s a number of different things that we can really cover as a topic. Greg Sher: And so the realtors for this lunch and learn, do they typically come into your office? Do you do it off premises and is there a limit to the amount of agents you like to have to keep it intimate? Justus Sharp: Depends on the topic. We have done them primarily at our local library. My community that I live in is Grove City, Ohio. We have a new library there, so it’s a very good conducive space for a lot of my agents, and since about 75, 80% of my business comes from that Grove City market, it was best to do it there and not here at the office, but we are hosting some here at the office, as well, for this corridor, this area of town, as well. Greg Sher: And is it the more the merrier or is there a number that you try and shoot for and not go above? Justus Sharp: Well, we want to try to gauge that, depending on if there is a CE requirement class, so we have partnered with our Ohio Housing Finance Agency who is our bond program here in Ohio. They do have a minimum requirement of 15 or more at least have signed up, since it’s a CE class. That’s the only way those can be done. Other than that, I don’t mind having them a little bit more intimate, because then you can engage with each and every one of them, especially if it’s just realtor-based. Now if it’s a pretty broader range topic, where we have business partners and realtors there, the more the merrier. Greg Sher: In some instances, you’re actually encouraging them to come. Not only are they going to hear something very valuable, but they’re also going to get credit. What does that credit go towards and how often are you doing these things for credit for them and how often is there no credit involved? Justus Sharp: It’s probably, I would say, over this year it’s been about 50/50. We’ve had a handful of them be for continuing education credits for the realtors. Our Ohio Housing Finance Agency, they have a specific person that has a bunch of different topics that they can address, and they can be anywhere from one hour to three hours of continuing education, so depending upon that. And then the other topics that are well attended by realtors are … we had a Meet the Appraiser, so that one was very, very well attended. There wasn’t any CE, but we’ve also joint ventured with a title company, so those have been a co-branded, and allowed us to leverage their invite list as well as our invite list. Greg Sher: Got it. You’ve done so many of these lunch and learns. Is there one that comes to mind or one scene that comes to mind that seems to resonate most with realtors that keeps their engagement level as high as it can go? Justus Sharp: I think two of the most well attended ones were Meet the Appraiser. That one we had 20 plus sign up. Also very well attended was with [OFA 00:09:45]. It’s a one hour CE credit that was for marketing to millennials, which is an approved elective credit for the realtors. That one was very, very well attended. Greg Sher: If loan officers are listening right now that love the idea, believe in the idea, but have no idea how to get it off the ground, give us a couple of pointers, to get their first lunch and learn together. Justus Sharp: Sure. What I did is on the calls to realtors, on my communication with realtors was hey, what topics are you interested in? I just asked them. It’s fairly simple. You just, hey, what’s new? What’s the latest, greatest? What’s going on? And just poll them, so to speak, and then go out and find, through my network, the speaker, because I didn’t want to do the speeches always. The first one that we started it off, I did, and just did a briefing on training model. Outside of that, we survey everyone that’s there at the lunch and learn, asking them if this was beneficial to their business, if they’d come again, what topics they want to hear about again. That way we’re always presenting them something that will bring them back. Something that’s interesting to them. Greg Sher: Well, Justus, this has been really valuable. Appreciate your time. I know you have loans to close and realtors to engage with. Continued success. We love having you at NFM and really appreciate your time. Justus Sharp: Hey. Very thankful to give this and I appreciate the opportunity. Thanks, Greg. Greg Sher: It’s a pleasure. We’ll see you next time on NFM Media.